But where is Lea Michele? And where is Chris Colfer? And while we understand that Chris wants to keep his personal life personal, we don’t think many people would think worse of him if he’d address the issue head-on. C.C. has been wishy-washy, at best, when it comes to talking about his life as a gay man and doesn’t help matters with BS answers to Q’s about gay rights issues. The straight gals can’t be the only ones living out and proud. Take the lead, Lea and Chris, and then urge the straight studs on the show to follow suit. We wouldn’t mind seeing them swap spit to celebrate! via Is Dianna Agron the Only Gleek Showing Her Pride? – E! Online. This is so out of order. I mean, I’m impressed with Dianna’s tumblr post and with Naya hosting the GLAAD awards, sure. But you cannot just sit there and wonder why Chris Colfer isn’t puking rainbows for the cameras. Being out is the single most important thing one can do for the rest of the LGBT community.That applies to you, to me and to famous people too. It’s not always possible and it’s never easy. 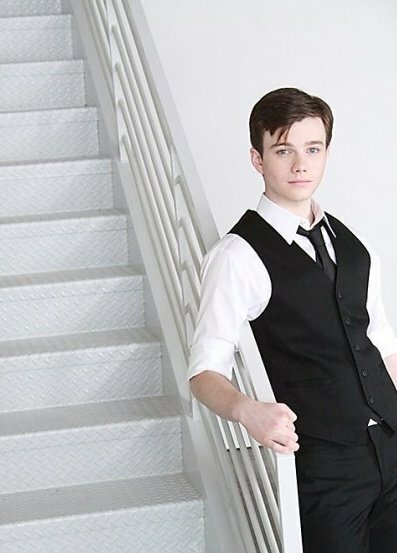 Chris Colfer was fairly squeezed out of the closet at the age of 19 (an age where I wouldn’t even have known I was gay), plays one of the most positive and nuanced portrayals of a gay teen on television, and did a video for the Trevor Project. And he’s only 21 years old. At the same time, he’s written a novel, sold a script to Disney, organised, cast and is about to start filming a movie he wrote, and worked as part of the hardest working tv cast out there. Chris Colfer, an openly gay 21 year old guy, was on the Time 100 Most Influential People list. He let right wing bigots take photos with him at the White House Correspondents’ Dinner and then appeared on Piers Morgan Tonight and said exactly what he thought of them. (yes, I cheered). So, yeah, I’m a fan. Sue me. (please don’t). Gay people don’t have to be activists. We all have responsibilities to our community, but we don’t have to wear rainbow flags as capes. Right now, gay kids have one more hero to look up to. One more openly gay, once-bullied-in-school, successful and confident person who is showing them that they can be who they are and be successful and happy too. And, you know what? Totally enough. Five ways Paris Hilton can reclaim her fame! So, my main aggravation now is that someone is giving him a platform. I think there’s a difference between being LGBTQ and famous versus being famous for being LGBTQ, or using one’s sexuality/gender identity/gender expression as part of one’s art and/or a selling point for one’s public persona. I had a really great conversation with someone a while back about how while I could probably make some money writing one, I’m not particularly keen to go sell a trans memoir. There are people like Kate Bornstein, S. Bear Bergman, Buck Angel, and Chaz Bono who are happily monetizing their transness and doing it with great panache. Me, I’d prefer to be that guy who writes books and stories who is also openly trans and queer. Is it part of the conversation? Well, considering that I’m using my pro site to raise funds for my top surgery, oh hell yes it is. But I don’t really expect to be paid for it. If someone wants to hire me to be insightful about it, maybe I’ll happily do that once in a while — that’s the bread and butter of those folks I named above, who do their work and activism with panache and passion, and who make my life better for it — but I’m happier aiming to be in that camp of people who can be role models be being…well, not normal, but by doing a thing first with my identity running in parallel. And really, Colfer serves the community in spades by being a) out, b) playing gay while being gay, and c) doing activism on top of his other work. I mean, if not activism, what on earth would you call the thing he did for the Trevor Project? Yes, and I think because nobody has that conversation, the media often miss the distinction between those famous for and those who are famous and.